Yoga mats aren't something one would expect to see in the conflict-ridden West Bank. But they're there. As Lubna Takruri reports in her article for The Guardian, Palestinians are turning to yoga to deal with the stresses of their lives. Yoga has long stayed out of the Palestinian community, due to a lack of teachers and the fact that yoga is viewed as being part of another religion. But thanks to social media and the Farashe Yoga Center in Ramallah, yoga is starting to take off, not only in the larger cities, but also in small villages and refugee camps. The Farashe Yoga Center, a non-profit that opened in 2010, runs out of Ramallah, the de facto capitol of Palestine. In 2012, Farashe gained support from the Washington, D.C. non-profit, Anahata International, which seeks to "share the physical and mental health benefits of yoga and holistic wellness services with individuals in need," according to their website. 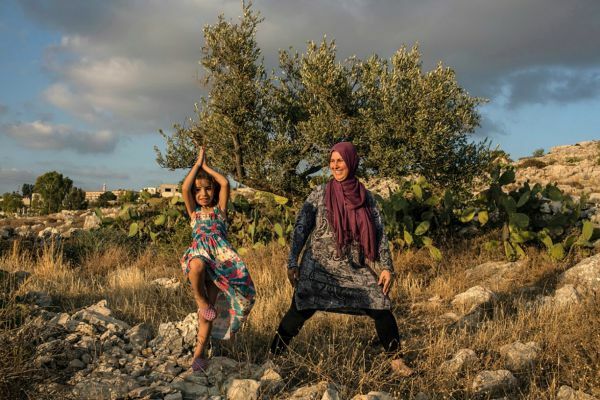 Due to the support of Anahata International, Farashe was able to run teacher trainings, with the intention of bringing the self-care techniques of yoga to more parts of the Palestinian West Bank through eighty freshly-trained yoga teachers. Palestinians who live under the Israeli occupational forces deal with daily stressors that many of us will never know. They've been looking for something to help them through their day-to-day lives, and for more and more people, yoga is now the key. “It helps people reach inner balance. It helps ease these pressures. Even to just have one hour for ourselves to step away from the negativity, listen to our hearts, our minds, and rest, this hour will help so much,” says Basma Abu Sway, a Farashe board member. However, it can be easy to be too optimistic about the effect yoga will have on the region. The practice of yoga has met with some resistance in more conservative regions, due to its connections to Hinduism and Buddhism. And Abu Sway is quoted as saying that yoga will not bring about the end of the occupation. It won't solve all of the problems for Palestinians. Right now, it is just a highly effective solution for stress-relief. But the things yoga can teach are perhaps the most effective. Hope. Optimism. Being content with yourself. Calmness. While yoga might not be the be-all-end-all solution for everything, the techniques one can learn in the practice may lead to better understanding among people. For now, the yoga community in Palestine is working toward becoming independent of the international community and volunteers. This means making classes more accessible; through more teacher trainings, workshops, and offering classes in Arabic. Only time will tell what will happen in Palestine. But cultivating peace and relaxation, one person at a time, can only be beneficial.